News Limited has launched a new advertising campaign for The Australian, presenting the national newspaper as the source of both intelligence and inspiration. 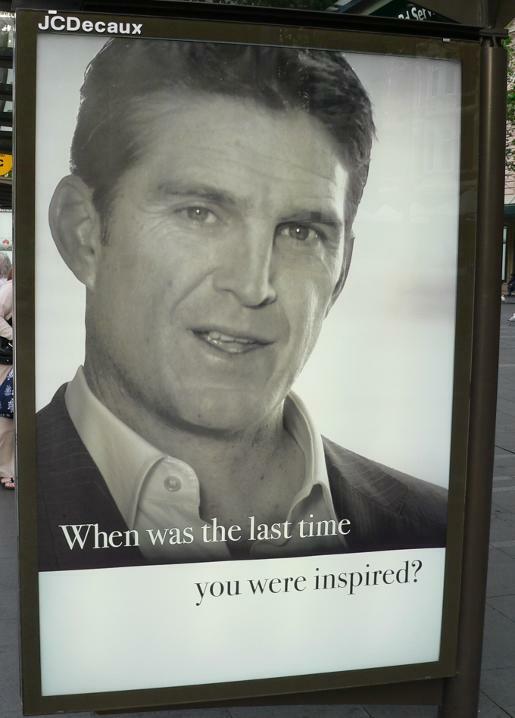 A television commercial and a range of print, outdoor, radio and online advertisements ask stimulating questions, ending with the critical challenge, “When did you last read The Australian”, and the two words, “Think Again”. Featured in the 12 month campaign are prominent Australian personalities and thought leaders including Philip Adams, Ray Martin, Tetsuya, Gerry Harvey, Peter Cosgrove, Grant Hackett, Tim Horan, and Collette Dinnigan. When did you stop asking questions? When was the last time someone quoted you? When was the last time you were inspiring or inspired? When did you discover that you could influence others, be listened to and change the way the world thinks? When did you last read The Australian? The Think Again campaign was developed at Thebrandshop, Sydney, by executive creative director/copywriter Monty Noble, art director Rodd Martin, group head Kate Meyer and account manager Carly Hanson. Filming was shot by director Rodd Martin via UFO Film with producer Les Luxford and director of photography Peter Moss. Music and sound production were produced by Joel Woolf. Editing was done by Engine.